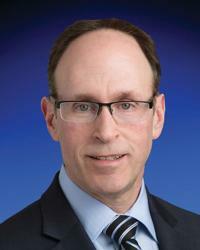 Geoffrey Sklar, MD, member of the MedStar Health Cancer Network, serves as Associate Director of the Weinberg Cancer Institute at MedStar Franklin Square Medical Center. In tandem with that appointment, he also serves as medical center’s Chief of the Division of Urologic Oncology, as well as Chief Medical Officer for Chesapeake Urology Associates. Dr. Sklar is recognized across the Baltimore region as an innovator in urology care, specializing in the diagnosis and treatment of kidney cancer, bladder cancer, erectile dysfunction and Peyronie’s disease. He is one of few local physicians trained to perform blue light cystoscopy, an innovative, technology-based tool that aids in precise detection and diagnosis of bladder tumors. Additionally, Dr. Sklar has earned professional accolades for the extensive research he has conducted and published, contributing to the advancement of care for patients with erectile dysfunction, Peyronie’s disease, transplant ureteral reconstruction, cryosurgery, endoscopy, urological oncology and benign prostatic hyperplasia. He is certified by the American Board of Urology and is a Fellow of the American College of Surgeons.